With the first quarter of 2019 coming to a close, it’s easy to forget the retail sector since the holidays are a distant memory, but the recent rally in the sector is a reminder to investors that they should consider adding retail-focused exchange-traded funds (ETFs) to their portfolios. 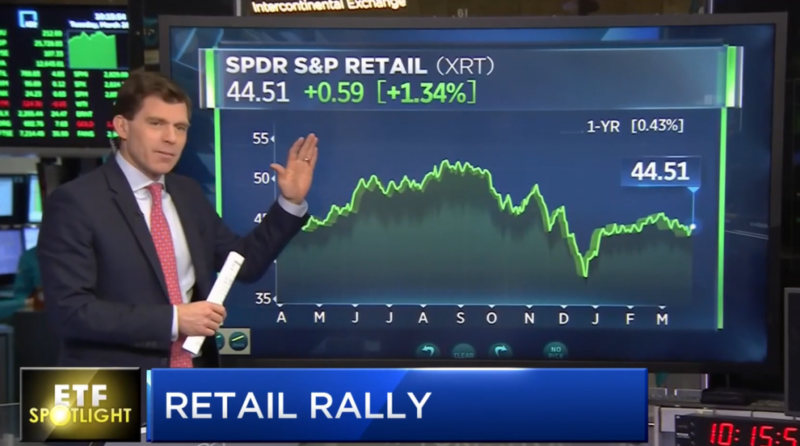 While strength in the retail sector piggybacks off of strong consumer spending, there has been a lot of movement within the sector that could make for some interesting ETF plays. For example, shares of Bed, Bath & Beyond surged 25 percent with activist investor interest–moves like this that could shake up the core foundation of longstanding retailers and inject a new lease on life, particularly those that are struggling. According to the NRF, sales this year should total more than $3.8 trillion–a figure that does not include sales from automobile dealers, gasoline stations and restaurants. Additionally, the NRF numbers showed a continuing trend of growing online sales as consumers shift from brick-and-mortar stores to the internet. Online and non-store sales rose 10.4 percent higher last year and the NRF is predicting more of the same for 2019. With more activist interest, buyouts and divestitures, the retail sector could be an interesting space to play for the rest of 2019. Here are three ETFs to consider. XRT seeks to provide investment results that correspond generally to the total return performance of an index derived from the retail segment of a U.S. total market composite index. In seeking to track the performance of the S&P Retail Select Industry Index, the fund employs a sampling strategy. It generally invests substantially all, but at least 80 percent, of its total assets in the securities comprising the index. The index represents the retail segment of the S&P Total Market Index (“S&P TMI”). XRT is up 11.93 percent year-to-date. RTH seeks to replicate as closely as possible the price and yield performance of the MVIS® US Listed Retail 25 Index. The fund normally invests at least 80 percent of its total assets in securities that comprise the fund’s benchmark index. To be initially eligible for the index, companies must generate at least 50 percent of their revenues from retail. Retail includes companies engaged primarily in retail distribution; wholesalers; online, direct mail and TV retailers; multi-line retailers; specialty retailers; and food and other staples retailers. So far this year, RTH is up 8.82 percent. IBUY seeks investment results that generally correspond to the price and yield of the EQM Online Retail Index. The fund will invest at least 80 percent of its total assets in global equity securities that comprise the index, which will primarily include common stocks and/or depositary receipts, such as ADRs and GDRs. The index seeks to measure the performance of global equity securities of publicly traded companies with significant revenue from the online retail business. The index methodology is designed to result in a portfolio that has the potential for capital appreciation. IBUY is up 22.22 percent YTD.